Five Common Findings in CSI - Graffiti and Site Drainage (Part 3 of 3) | Easements Atlanta, Inc. In Part 1 and Part 2 of the ‘CSI’ serial blog, we discussed three of the five most common findings during Easements Atlanta’s Conservation Site Inspections: the deterioration of both steel windows and wood windows, lintels, and masonry mortar. The last two common findings of this blog installment is the prevalence of graffiti and proper removal techniques, and how effective site drainage will prevent building deterioration. Example of graffiti tags on granite. Graffiti happens. While there’s an ongoing discussion on the value of graffiti within our society and culture, where does this leave the property owner whose building has become the canvas for unsolicited graphics? For many property owners in the urban and industrial reaches of metro Atlanta, their buildings have been defaced by tag artists who leave their mark using paint, spray paint, marker pens, and other medium. Easements Atlanta recognizes some buildings within their portfolio are in areas more prone to graffiti. To assist property owners, the CSI team has researched the difficult task to select the appropriate method, technique and cleanser for successful graffiti removal. First, identify the medium and how long it’s been on the surface. Wax-based crayons, lacquer spray paint, and acrylic brush-applied paint will require different approaches to remove. Days old graffiti will be easier to remove than weeks- or months-old graffiti since the medium’s binder hasn’t completely solidified. 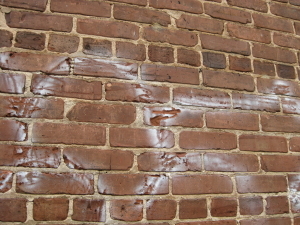 Example of irreversible damage to brick by high-pressure wash and graffiti removal unsuccessful. 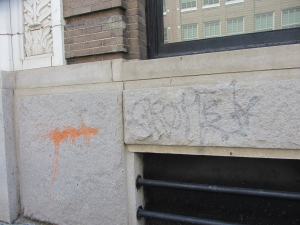 Next, identify the type of masonry where the graffiti is applied, which includes all types of natural stone, brick, terracotta, precast concrete, and mortar. The different types of masonry require different approaches because of different porosity, sensitivity to abrasion, and sensitivity to acids and alkali. For example, acid-sensitive limestone is highly porous and fragile, as opposed to granite’s impermeable, non-acid sensitive durable surface. These differences are why high-pressure washing and abrasive cleansers aren’t the universal answer to graffiti. Third, remove graffiti as soon as possible by the gentlest means. And always pretest a chemical cleanser on the masonry in an inconspicuous location. 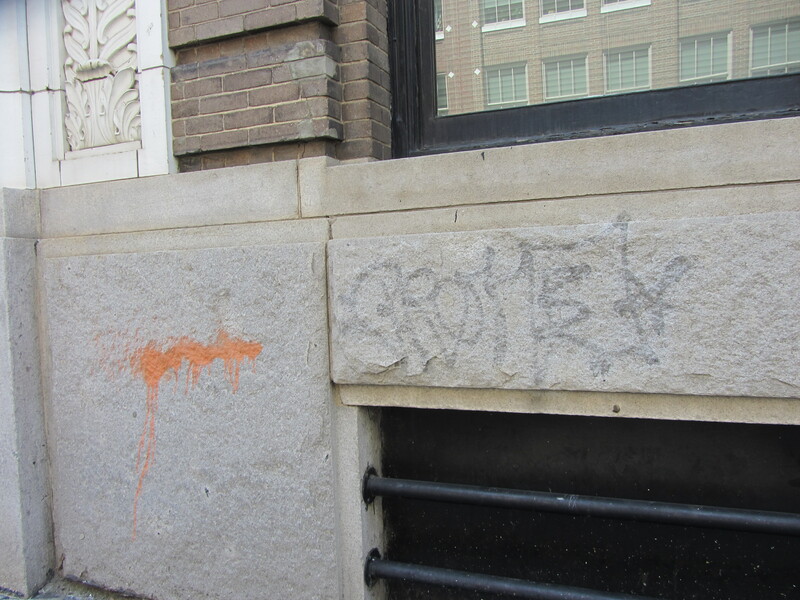 Here’s a charted roundup of Graffiti and Tag Removal Treatments for Historic Masonry Materials. Example of ongoing graffiti tags. On-going graffiti tags despite best attempts to thwart it may be a good reason for an anti-graffiti sacrificial coating, which prevents graffiti from bonding or makes it easier to remove. For historic masonry, look for anti-graffiti coatings that are sacrificial, breathable, transparent, have a proven track record for UV light-resistance, doesn’t allow accumulation of dirt, nor have a high-gloss finish. 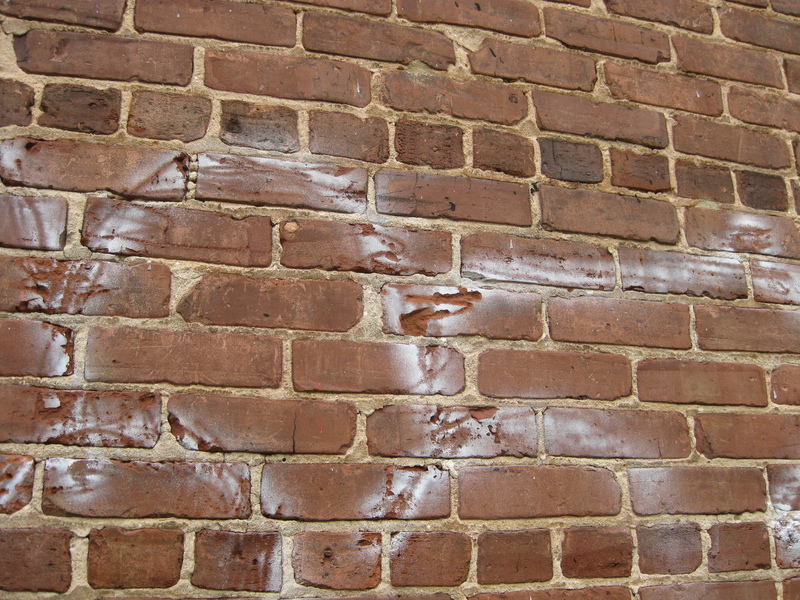 Sacrificial coatings cause the least damage to historic masonry and require a simple reapplication every few years or after each graffiti removal. Remedial resources for the standards used to evaluate removal solutions and a slideshare comparison of graffiti cleaning methods. There are also further Building Conservation considerations. The non-profit Keep America Beautiful shares community resources and tips through their program Graffiti Hurts. Finally, for a list of tested proprietary products, please contact us. 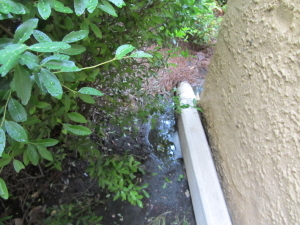 Example of inadequate downspout with pooling water at foundation. A wet basement isn’t the only clue to poor site drainage. The CSI team has seen it manifest through capillary action (“rising damp”), efflorescence, brick spall, masonry degradation, and organic growth. No matter the symptoms observed, steps should be taken to correct the site drainage. 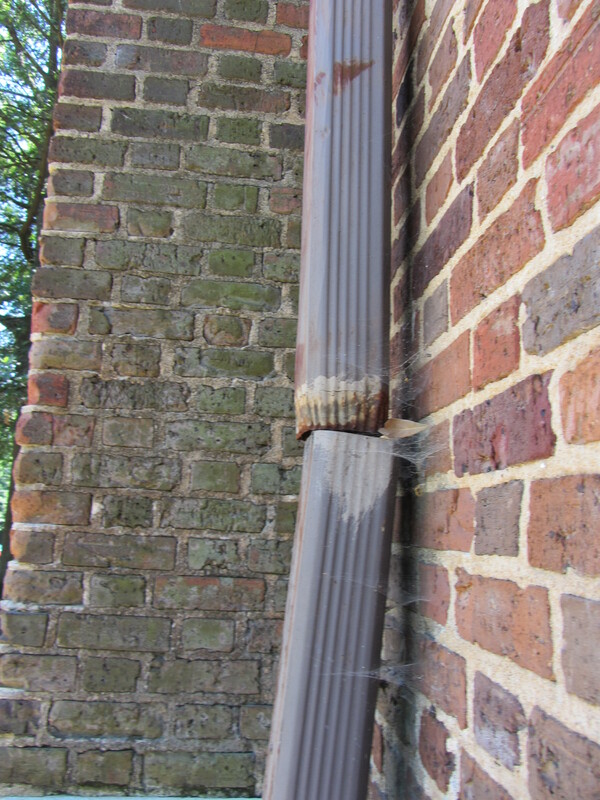 Proper handling of rain run-off is one of the most important measures of controlling unwanted ground moisture, a major source of deterioration in historic buildings. On occasion, the CSI team will schedule a site inspection during a rain shower to observe the performance of gutters, scuppers, downspouts, in-ground drains, and site grade. If all roof-level drainage components perform properly, the CSI team focuses on the ground-level components. 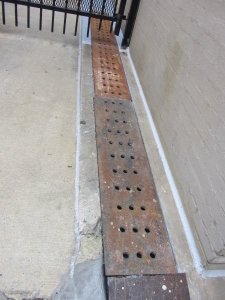 Example of urban trench drain to carry run-off to street curb. Many times, downspouts fail to extend far enough beyond the foundation, instead water drains directly against the foundation or flows directly to a depression in the ground within a few feet of the foundation. 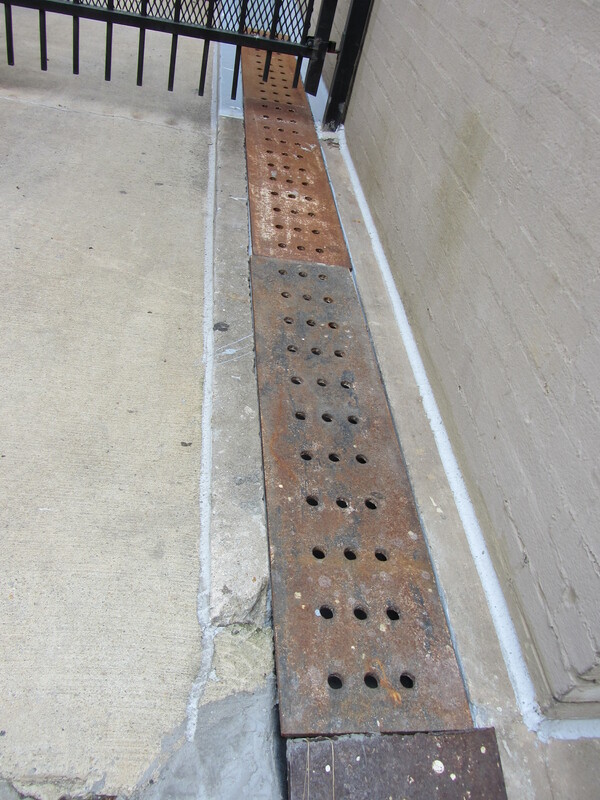 At a minimum, flexible drainage tubes should carry runoff away from the building to the greatest extent possible; those buildings in an urban commercial area should install in-ground or French drains that carry runoff to the street curb. To further improve site conditions, and ultimately the building’s preservation, regrading the land to make a swale or sloping grades may be an option at some properties. The sustainable practice of capturing runoff in a cistern or rain barrel should also be explored with the help of Easements Atlanta. The last level of corrective action is to control vapor diffusion at foundation walls, but the excavation of foundations and the use of dampproof coatings and footing drains should only be used after the measures listed above are implemented. Once corrections to transport water away from the building are observably functioning, the corrections to masonry damage should be undertaken. It’s important to recognize moisture is always present to some degree in building materials and it doesn’t necessarily damage them. Though there is a point at which moisture is excessive and damage will occur. Rising damp should correct itself once water is effectively drained properly, however, if you see white staining on the surface of your bricks, it is actually efflorescence, a salt stain left behind when water dries. This white powder can be removed easily with a dry stiff-bristled (not wire) brush and a vacuum, or with the addition of strong soapy water. Repeat cleaning may occur due to vapor diffusion and residual moisture migration as the wall dries. Example of algae growth caused by back splash from unattached downspout. Organic growth, such as algae, mildew and moss, are commonly seen on consistently damp walls. When the dampness is interrupted, growth will stop, but stains may be left behind. Success has been had with agitating Simple Green All Purpose Cleaner on brick and limestone surfaces with a nylon bristle brush, then rinsing with low-pressure (<300 psi) water. Brick spall, powdery mortar and bricks, crumbling stucco, and masonry degradation along the foundation walls is a symptom of excessive dampness over many years and is considered to be at the extreme end of deterioration. Because the foundation walls are structural components of the building, simply covering it with a coating or painting it will not only trap the unwanted moisture, but ignores the structural loads the foundation carries. A structural engineer should be consulted, but generally, a spalled masonry unit won’t pose a structural problem, however, larger areas of, say, missing mortar and powdery brick will need attention. 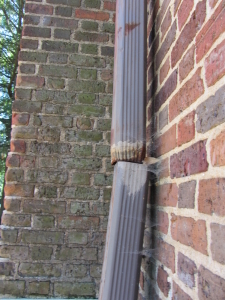 The appropriate method is to rebuild the section of deteriorated historic masonry units with comparable replacements. Remedial resources for a comprehensive look at controlling unwanted moisture and diagnosis and treatment of moisture in historic masonry walls provide more helpful information. 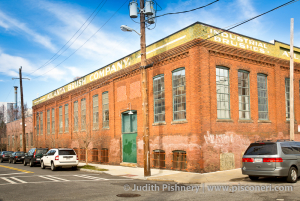 Easements Atlanta ends this three-part serial blog with the desire to conserve as much of a building’s historic materials to ensure its architectural and historical integrity is intact for our generation and future generations to enjoy. The conclusion is that good maintenance is good preservation.